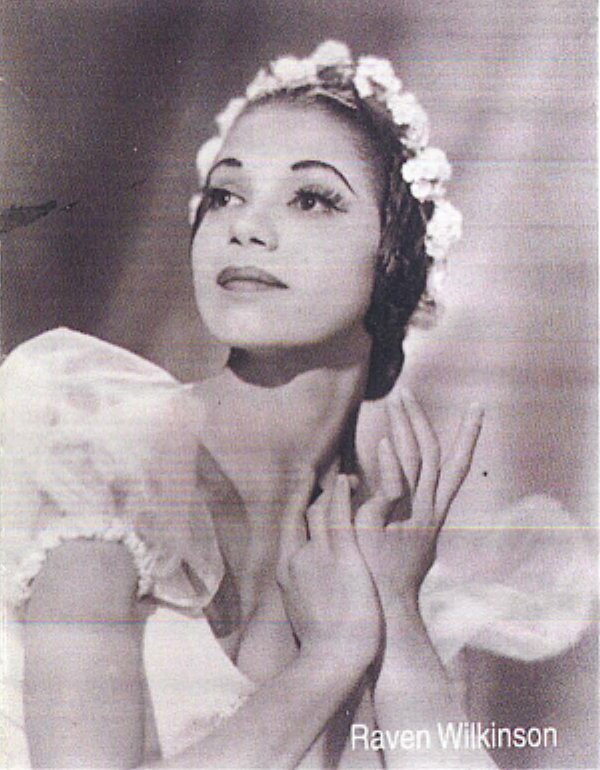 When Raven Wilkinson was about five years old, her mother took her to the City Center Theater to see the Ballet Russe de Monte Carlo. The ballet was Coppelia and when the curtain opened, Raven was enraptured by what she saw on the stage. After seeing her first ballet, Raven wanted to be a dancer. But because of her age, no school would accept her. When she was nine, her uncle gave her a gift of lessons at Ballet Russes School. Her teacher, Vecheslov Swoboda, took an interest in little Raven and nurtured her. Madam Swoboda was the biggest influence in her life and dance career. Later, as an adult, Bill Griffith became her mentor. Sergie Denham, director of the school and company, was impressed with Raven's progress. He offered her a strange proposal: Denham wanted her to be part of the company without a contract. He told her that there was another girl in Chicago he wanted to see before giving her a contract. Raven felt they wanted to see how she would be accepted in the south. Raven made it clear that she would not advertise that she was black, but she would not deny it either. When they got to Chicago without any problems, it turned out that there was no other girl. In 1954 they gave Raven a full contract, making her the first African American to be a member of a major ballet company. In the second season she was promoted to soloist, and stayed with the company for six years. On a tour of one-night stands she roomed with Eleanor D'Antuono. For two years there was no problem until a black elevator girl recognized her as African American and reported her to the management in Atlanta, Georgia. Even though she had roomed at the same hotel in the past, the clerk wouldn't let her stay. They called a cab to take her to a black hotel. Eleanor was going to go with her, but because of segregation Eleanor wasn't allowed to stay in a black hotel. In Montgomery, Alabama the KKK heard there was a person of color performing in the theater. During rehearsal they marched down the aisle in their white robes and on to the stage. They asked each group of girls if they knew which one was a negress; no one would answer, even in her group. That night Raven danced in performance. When the season was over they didn't fire her but suggested that she had gone as far as she could in the company. Raven was tired after six years of one-night stands, and she took this as a sign that it was time to leave. Getting another job as a dancer was very difficult, so Raven, who had always been a devout Catholic, joined a convent. After eight months her love for ballet and theater made her realize that the stage was where she wanted to be. Raven found that no other major ballet company would hire her, even though she was willing to go back into the corps de ballet. In 1967 she went to Holland and became a soloist with the Dutch National Ballet. Missing her homeland, Wilkinson returned to the USA in 1973 and the next year joined the New York City Opera as a member of the ballet ensemble. After retiring from dancing she continued to perform with the company as a supernumerary until the company ceased operations in 2011. Wilkinson passed away in Manhattan on 17 December 2018.